Lack of diversity in the ranks as well as a failure to resonate with disadvantaged groups and other anti-oppression movements has been cited as one important barrier to the American Nonhuman Animal rights movement’s success (Kymlicka and Donaldson 2013). It is possible that social movements are actively inhibiting diversity in the ranks and audience by producing literature that reflects a narrow activist identity. This article creates a platform from which these larger issues can be explored by investigating the actual demographic representations present in a small sample of popular media sources produced by the movement for other animals. A content analysis of 131 magazine covers produced by two highly visible movement actors, PETA and VegNews, was conducted to demonstrate that activist representations in at least some dominant American Nonhuman Animal rights media are mostly white, female, and thin. Wrenn, C. L. (2016). 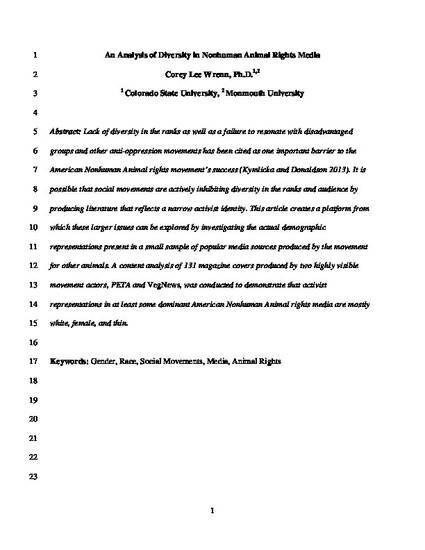 An Analysis of Diversity in Nonhuman Animal Rights Media. Journal of Agricultural and Environmental Ethics, 29(2), 143-165.